Industrial lighting leader, Larson Electronics LLC, announced the release of a new explosion proof LED fixture with an adjustable table arm mount (EXHL-TBL-LE1-50C-1227-EPP). This table arm mounted LED has been specifically designed for inspections in hazardous locations. The adjustable arm on this explosion proof LED enables it to quickly mount to surfaces without wasting time trying to install it. Quick and painless. 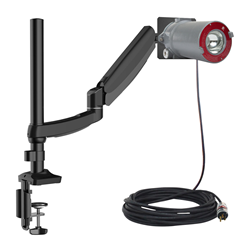 This explosion proof adjustable LED fixture from Larson Electronics features an adjustable table arm mount that eliminates the need for removing the light when repositioning, making it great for industrial inspections that require great attention to detail. It can be attached with a clamp to tables, work benches or other compatible structures. This explosion proof LED is rated NEMA Type 3, 4, 4X, 7 (B,C,D) and 9 (E,F,G) and designed to withstand the rigors of demanding environmental and operating conditions, while still remaining lightweight. It requires no installation or special tools, and includes a 50’ chemical and abrasion resistant SOOW cord. This explosion proof LED light fixture comes available in two lighting configurations, spot and flood, and operates on voltages of 120-277V AC. The LED housing is composed of cast copper-free aluminum while the lenses is made of tempered glass, making is resistant to shock and vibrations. The ability to operate in extreme temperatures and the waterproof design enable this explosion proof fixture to be used in Class I, Divisions 1 and 2 and Class III, Divisions 1 and 2 hazardous locations.